After many, many attempts, Alexis has finally perfected this sauce. Last time it didn't break, which was a relief, but this time the consistency was perfect. This sauce involves lots of patience, the substitution of half and half for cream and a spoonful of cornstarch. Click here for the recipe. This salad was served room temperature and was hearty and bright at the same time. Roast the carrots and turnips on 375 until fork tender. Set aside to cool. Puree the remaining ingredients until a paste forms. When the veggies are cool, toss them in the cilantro pesto. We hadn't been to the Pork Store, our favorite breakfast place, for a long time. This is probably because it is nowhere near our place and we are really lazy. However, this morning, we woke up with a hankering for biscuits and gravy and The Pork Store is the best place in the city for this particular concoction. The chicken fried steak is crispy on the outside and so tender you can cut it with the edge of the fork. The hash browns are good, but I really only like the crispy bits. The pork chops are plentiful and tender. This is a very country breakfast. Light fluffy biscuits drenched in peppery, smooth gravy with lots of sausage bits. Giao really wanted this, although to Alexis it looked horrid. We forgot to take a picture before Giao devoured it, however. We went to a coworker of Giao's house for a BBQ. She graciously hosted this nice BBQ for their entire (albeit small) company, plus SOs. Everything was pretty tasty. On this plate is pickled cauliflower, pasta salad, grilled sausage and grilled shrimp. This burrito was HUGE and really pretty darn good. The best part was that the grilled the tortilla first so that it was extra crispy on the outside. Lettuce cups are a great meal for when you have a lot of random ingredients to use up. They are also tasty and healthy. Sautee the onions in some of the soy sauce. Add all of the other ingredients and sautee until the meat is doen and the liquid has evaporated. Serve in large lettuce leaves. 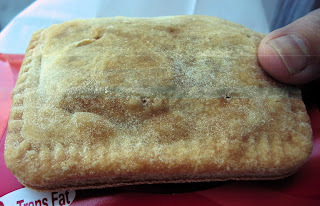 Walking by Jollibee, the Phillipino fast food joint near our house, we noticed that they had empanadas. We are suckers for meat pies, so we had to try it, even though we'd just eaten breakfast. A bit too doughy and a bit too sweet because of the raisins, but not a bad deal for two bucks. This was literally a 20 minute dinner. You can't beat that for timing. Take that, Rachel Ray. Mix the mustard and vinegar and pour over the salmon. Bake the salmon on 375 for about 10 minutes. While the fish bakes, steam the chopped bok choy. Mix the doy, Splenda and vinegar and pour over the bok choy. It was cinco de mayo and so we had to eat something Mexican, or a derivative thereof. In addition to the shrimp, we layered sour cream, cheese, salsa verde, chopped black olives, sauteed spigariello and beans into a low carb tortilla. In a bit of olive oil, sautee the shrimp until just done, the add all of the other ingredients and serve. Sautee the chopped spigariello in a little olive oil until tender. Season with salt and pepper. Sautee the onions and garlic in a bit of oil until golden. Add the refried beans and heat thoroughly. We went back to Ad Hoc and had another great meal. The cost is $48 per person and for that you get 4 courses and free seconds. The atmosphere is casual and the food is stellar. This salad was loaded with butter lettuce, fingerling potatoes, fresh peas, purple cauliflower and baby carrots. The dressing was light and slightly acidic and let the flavor of the veggies shine through. This dish was perfectly seasoned and somehow hearty and light at the same time. The meat was succulent and the skin was crispy. What more could we ask for? We can't remember what type of cheese this was, but it was tasty. This was a perfect (and fun) way to end the meal. We each got a perfect single scoop of vanilla ice cream and a tray full of toppings, including caramel sauce, chocolate sauce, fresh strawberries and candies pecans.